Last weekend I was at a party where I got the chance to play the video game Rock Band for the first time. 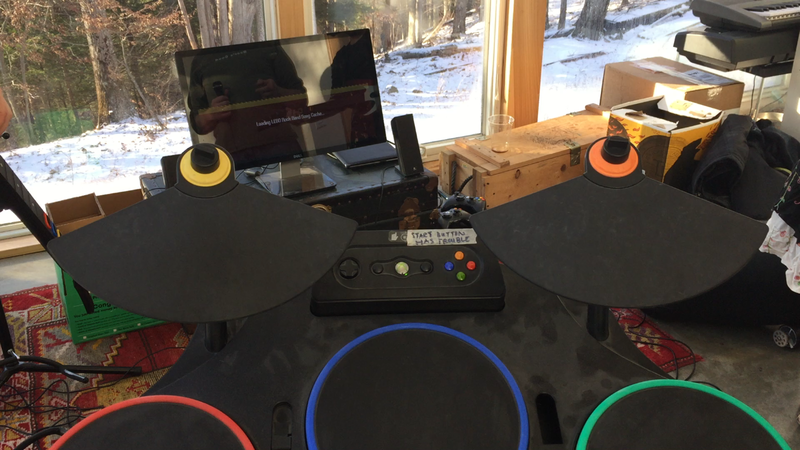 Having been a drummer for almost 20 years, I thought it should be a piece of cake to sit behind the game controller of rubber and plastic electronic drums and start jamming with the rest of the players. I gave my drumstick a twirl as the screen started clicking off a beat to a classic Yes tune (yeah, I was playing with a bunch of adults my age – it’s called classic rock for a reason) and then I started getting my cues from the screen. All I had to do was watch the stream of different colors come down the pathway toward me and hit the gamepad “drums” for each corresponding color in time with the beat. But playing a drumming video game is not the same as playing actual drums. In fact, my experience playing drums probably made me worse at Rock Band because I had years of muscle memory built up that I had to ignore. This was suddenly a lot harder than I expected – and being surrounded by gamers who were all playing on “Expert” level didn’t help my ego much. But here’s the good news: it turns out that recent research on habits and behavior has shown this kind of disruption of our environment is an important part of making changes to any habit, especially the bad ones, and that’s something we can learn to use to our advantage. The power of something being “so deeply ingrained that they are very hard to resist” is exactly what I found myself struggling with as I played this game. As the song began within the game, my instinct was to play a standard rhythm using my hands and feet for specific parts of the beat as I always had – right foot on bass drum beat, left hand filling on snare drum and toms, right hand marking time on cymbals. But as I tried to play along to the song the way I expected, I found myself missing the targets going by because they were not coming up when or where I expected. The colors on the screen didn’t seem to match the drum patterns I would have been playing if they were actual drums, and I lost track of the beat. And then I forgot which color corresponded to which pad. It was frustrating. But I wasn’t supposed to be playing the drums; I was playing a video game. I had to stop thinking of these plastic pads as a drum kit and only think of them as colors if I was going to play successfully. The game was forcing me to rewire my brain, to let go of the instinctual patterns that had been so ingrained in me, and play these drums “the Rock Band way” instead. To battle bad behaviors then, one answer is to disrupt the environment in some way. Even small changes can help — like eating the ice cream with your nondominant hand. What this does is disrupt the learned body sequence that’s driving the behavior, which allows your conscious mind to come back online and reassert control. By changing the context and environment in which I was playing an instrument I thought I knew well, I was forced to change my behavior and apply my technical skills (how to hold and manipulate drumsticks efficiently around a drum kit) in a new way that broke my body’s ingrained routine. Suddenly I was using more of my brain for this task than I had been prepared for, raising my conscious engagement with the game. And as I adapted, I began to realize I was having more fun too. Turns out I’m not that bad at Rock Band. I just needed to stop thinking like a drummer and think like a gamer instead. And turning up the difficulty to “Hard” doesn’t hurt. Next Post → Coat. Hat. Gloves. Repeat.